Wet paper casting or embossing is a simple technique, yet one that produces interesting and effective results. 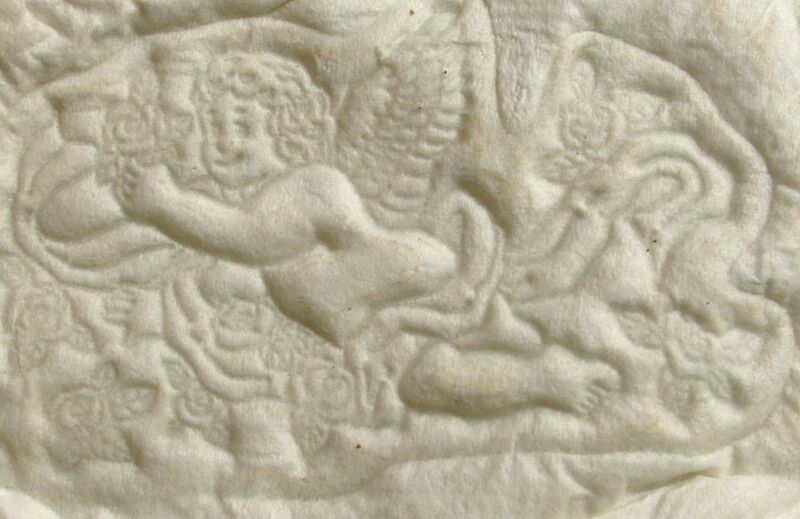 The technique uses wet tissue paper (toilet tissue) that is pressed into a stamp to create a 'cast' image. This works best with stamps that have deep impressions. This is a fun technique to try and can be used to make embellishments for cards and scrapbook pages. This is a technique where you will achieve different effects depending on the stamp - so experiment and have fun! Working on a protective surface such as a tray, gather the materials together. Place 6 sheets of toilet tissue onto a saucer filled with water. Wet the tissue paper thoroughly, squeezing out any air bubbles. Carefully place the wet paper over the die or raised image of the stamp. With a clean cloth such as a towel, press the wet paper into the stamp, gently squeezing the paper into the contours of the die or raised image. Keep gently pressing the paper until it is completely molded to the image. When this is complete, gently take the paper from the stamp and leave somewhere flat to dry. The length of time will vary depending on temperature and humidity. Check progress after a couple of hours. Trim away any unwanted paper and use the embellishment as required. Remember not to get the paper too wet; otherwise, the image will disappear. Spray the surface with acrylic varnish if a more hard wearing finish is required. Decoupage - Decoupage is a great way to add dimension to rubber stamping projects. How to Use Flock - Flocking adds a soft and velvety texture to rubber stamping projects. Make Great Use of Color - The good use of color can transform a project. Learn how to use color to make designs really pop! How to Stamp on Candles - Adding some rubber stamped decorations to candles can transform a plain candle into something really special. Using this simple technique, candles can be customized to match a room or table decor, personalized for a wedding or birthday, given a festive make-over or simply transformed into your own unique work of art. Heat Embossing as a Resist - The raised, glossy outline of a heat-embossed image makes a great resist. When inks or watercolor paints are applied over the top of the embossed image, the shiny surface of the image 'resists' the color. This is a useful technique and can be used in many rubber stamping projects.